Two militants were killed in an encounter with security forces in Sopore township of north Kashmir's Baramulla district. SRINAGAR: A top commander of Hizbul Mujahideen and his associate were killed in an encounter with security forces in Sopore area of north Kashmir’s Baramulla district on Monday while BSF men foiled an infiltration bid in Arnia sector in Jammu and Kashmir killing an intruder. A police official said acting on specific information, police, army and paramilitary personnel launched a cordon and search operation in Check-e-Brath area of Sopore in north Kashmir’s Baramulla district this morning. He said during the combing operation, militants hiding in the area opened fire on the search party. “The fire was returned by the troops, triggering an encounter. In the ensuing gunfight, which lasted for over four hours, two Hizb militants were killed,” he said. WATCH: Gunfight between security forces and militants during cordon and search operation. The slain militants were identified as Pervaiz Ahmad Wani and Naeem Ahmad Najar, both local militants. Police spokesman said Pervaiz was Hizb divisional commander. “Two AK rifles, three AK magazines, 90 AK rounds, One INSAS rifle, one INSAS Magazine, 13 INSAS rounds and other ammunition was recovered from the encounter site,” he said. Police termed Pervaiz’s killing as a major jolt to Hizbul Mujahideen. “Pervaiz was involved in serial blast on mobile towers in 2015. He was also involved in series of attacks on security forces and police killings,” the police spokesman said. He said Pervaiz was also instrumental in recruiting and indoctrinating many youths in HM in north Kashmir. 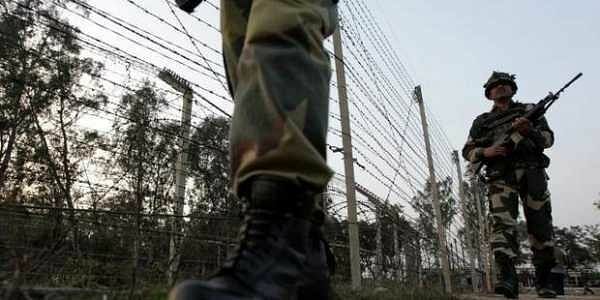 A BSF official said the border guards foiled an infiltration bid of militants on International Border (IB) in Arnia sector in Jammu province today. “A group of armed militants reached close to IB in Pakistan side taking advantage of bundh and thick wild growth. At about 3.40 pm, militants opened fire to engage the BSF men. The alert BSF men on duty points retaliated with effective fire,” a BSF spokesman said. He said Pakistan Rangers also supported the militants by firing on BSF posts. “By taking advantage of BSF men engaged in cross-fire, one militant climbed and jumped over the border fencing towards Indian side. However, the alert BSF men not only responded to the Pakistan troops fire but also shot dead the militants, who by then reached to approx 50 meters from border fence,” the spokesman said. Militants lobbed a grenade towards Road Opening Party (ROP) of 163 bn CRPF near Qazigund market in south Kashmir’s Kulgam district this afternoon. The grenade exploded with a big bang, injuring four CRPF men. The injured CRPF men were evacuated to army hospital in Srinagar, where doctors have termed their condition as stable. The injured CRPF men were identified as ASI Ram Raj, Ct. Sheshi Kant Yadov, Ct. Naresh Kumar and Prabunath Patnyk. Lashkar-e-Toiba has claimed responsibility for the attack.